Egypt is running low on cash. And this time, oil-rich friends like Saudi Arabia may not be able to come to its rescue. Egypt's lack of cash is threatening its ability to mount an economic comeback from the turmoil created by the 2011 Arab Spring. It's the main reason why Egypt has gone from being one of the hottest areas on the planet for investors just two years ago to one of the coldest. Egypt's foreign exchange reserves tumbled at the end of September to a six-month low of $16 billion. That's equal to just three months of imports, or the minimum cash cushion recommended by the International Monetary Fund. The anemic level of reserves means Egypt has "burned through" the vast majority of $12 billion in bailout cash it received last March from Saudi Arabia, Kuwait and the United Arab Emirates, said Jason Tuvey, Middle East economist at Capital Economics. "In light of the plunge in oil prices, there are concerns they are considering not providing Egypt with as much financial support over the coming years," Tuvey said. In other words, Egypt's benefactors have their own problems now. Last week, Standard & Poor's downgraded Saudi Arabia's credit rating because the oil crash has crushed the kingdom's budget. The downgrade came just days after the IMF warned Saudi Arabia will run out of cash in five years or less if oil stays around $50 a barrel. In that same report the IMF also pointed out that Egypt "receives sizable official grants" from these Gulf countries that are now grappling with cheap oil. Fears about Egypt's low cash levels and ability to tap Gulf neighbors for more are spooking investors. Egypt's stock market is slumping. The MSCI Egypt is down nearly 12% this year. Compare that with a 30% rally last year and a 52% surge in 2012. Research firm Markit said the cost to insure Egyptian bonds are at their highest level since Egyptian President Abdel Fattah el-Sisi was elected in May 2014. Investors are growing "increasingly bearish" about Egypt's sovereign debt because of the country's "current account chasm and freefalling currency," Simon Colvin, a research analyst at Markit, warned in a recent report. The timing of the financial turbulence is somewhat ironic because Egypt is enjoying a moment of political calm, especially compared with the recent five-year period that featured two separate revolutions. "Economic reality is trumping the country's recently found political stability in the eyes of investors," Colvin wrote. 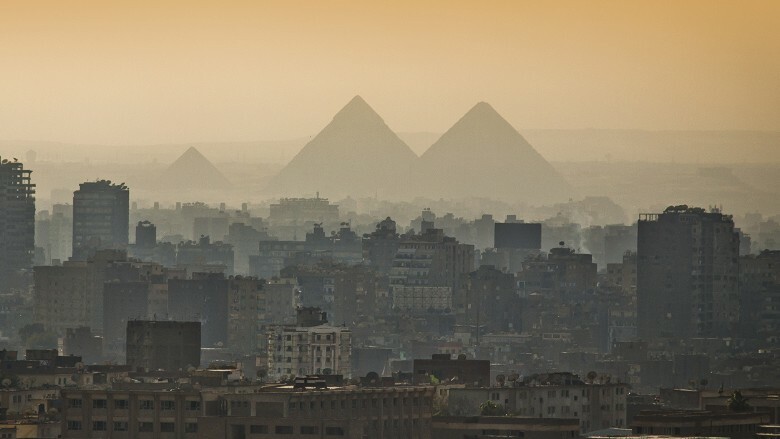 Egypt's economy has been rattled by a confluence of negative factors. Understandably, the political unrest and a series of currency devaluations have scared away many Western investors, causing a tumble in the country's foreign direct investment. Likewise, Western tourists have shied away from visiting the Egyptian pyramids, hurting the country's critically-important tourism sector. "Tourism is obviously soft. A revival there is desperately needed," said Tuvey. At the same time, Egypt is cracking down on its foreign currency black market. The move is hurting the economy by causing a shortage of dollars that businesses need to import goods. It's currently negotiating a $3 billion loan from the World Bank to help it overcome the currency shortage. Will Saudis keep lending cash? The big question now is: Will Saudi Arabia and its allies reach into their pockets this time to fund Egypt's fast-emptying coffers. "We don't think the Gulf will fully withdraw support for Egypt," said Tuvey. Though the Gulf is hurting economically, political motivations may force it to continue assisting to Egypt. Tuvey pointed to a desire by Saudi Arabia and other countries in the region for Sisi to continue its political crackdown on the Muslim Brotherhood. "The Muslim Brotherhood is seen as a threat to the monarchies in the Gulf region. In exchange for Sisi cracking down on the Brotherhood, they have provided Egypt billions of dollars," Tuvey said. Still, the oil crash is making it clear that Egypt needs to speed up economic reforms aimed at luring foreign investors back in. The IMF is also pushing Egypt to boost tax revenue, improve labor market policies and pursue "growth-enhancing spending" on infrastructure, education and healthcare.